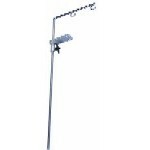 Constructed of chromed steel with plastisol coating at the contact points. 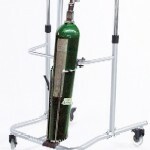 This portable oxygen tank holder rests on the front lower frame and is then bolted to the cross support frame. 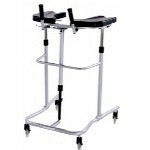 The placement tilts it toward the rear center of the walker and prevents it from tipping.